Zynaptiq are happy to announce the immediate availability of PITCHMAP version 1.5.0. This free update adds support for VST, RTAS and AAX Native on both Mac and Windows platforms, as well as many enhancements and fixes. 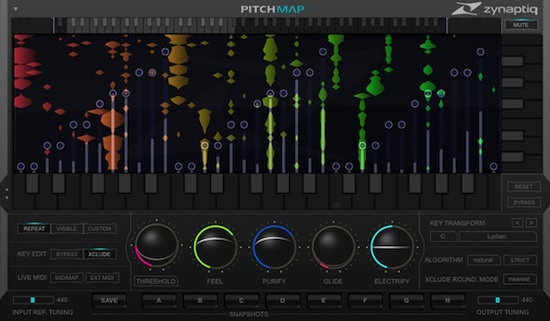 PITCHMAP is a demixing-based plug-in that allows changing melodies and harmonies of any mixed musical recording in real-time, either by transforming them to new ones played on a MIDI keyboard, or by setting freely defined target scales. Based on Zynaptiqʼs proprietary MAP (Mixed-Signal Audio Processing) artificial intelligence technology, PITCHMAP can be applied to a wide variety of tasks, including original music production, remix work, correction of tuning issues and creative manipulation of existing recordings. If you need to fine-tune or manipulate a single but polyphonic instrument, or a section of instruments, and using off-line editing doesn’t break your workflow, use Melodyne. If you need to tune or change the pitches of a full mix or other complex polyphonic signal in real-time and under MIDI control, while retaining all the transient crispness of any percussive elements, or if you want to create far-out sounds, or if you want to try out different harmonies on your loops and recordings from within the creative, musical workflow….use PITCHMAP. Depending on your field of work, you may want to have all three of them. (*) Please note that for tuning some types of polyphonic audio, offline processing may yield better results. The side-grade is priced at USD 199 / EURO 179 (incl. 19% VAT) - that is around 50% off! - and is available only for a limited time…so grab it while you can! Please note that after purchasing the side-grade, you will be required to validate your eligibility by providing information pertaining to the product you are side-grading from. All mentioned product names and trademarks are property of their respective owners. Product comparisons serve to clarify functional differences only and are the opinion of Zynaptiq.